The Eagle's Nest: If you want your kids to learn...sometimes, you have to bait the hook! If you want your kids to learn...sometimes, you have to bait the hook! 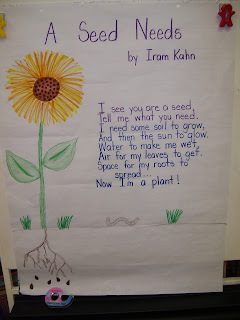 Our poem for the week...great for the trait of voice! It is written as the planter talking to the seed and the seed responding, hence it being written in two colors! 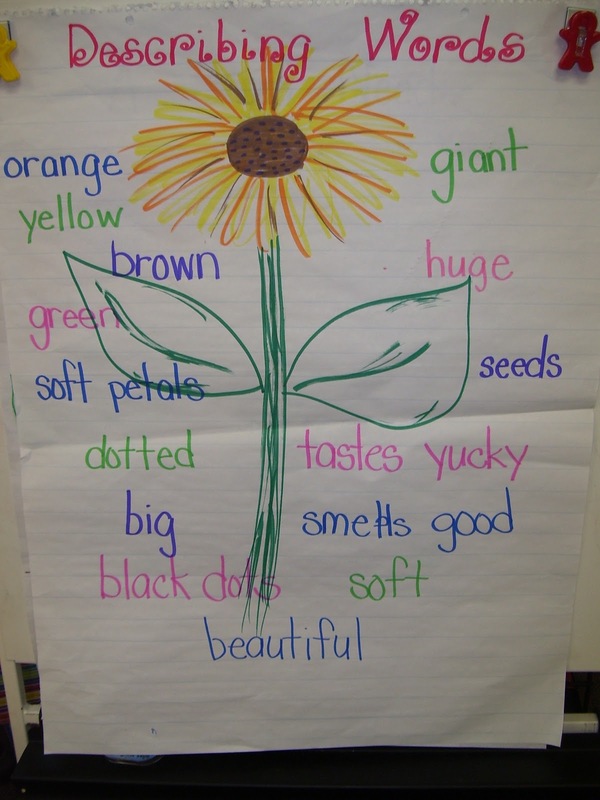 Working on using descriptive words in our writing. This lesson went over like a lead balloon, so thanks to my meeting yesterday, I have some new ideas! our Grass Heads. I was so busy doing dirt containment I didn't get any action shots. The Grass Head idea came from theteacherwife. I went to link it up with this post and the faces are no longer available. Sigh! We also journal about the growth of our plants. I found it on Primary Perspective. 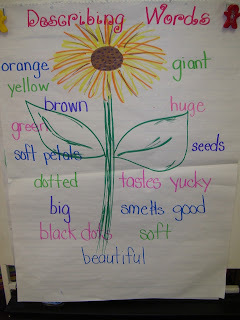 Hand print sunflowers with labeled parts of the plant. Gummy worm addition and subtraction game. I got this game from an old Mailbox magazine. It would be easy to remake though! The gameboard has 10 worm shapes. Each child gets a bag of 10 gummy worms and each group has a die with 2 +1s, +3, -2, a sad face and a smiley face. Smiley face means add one and roll again, sad face means clear your board and start over. They LOVE it! 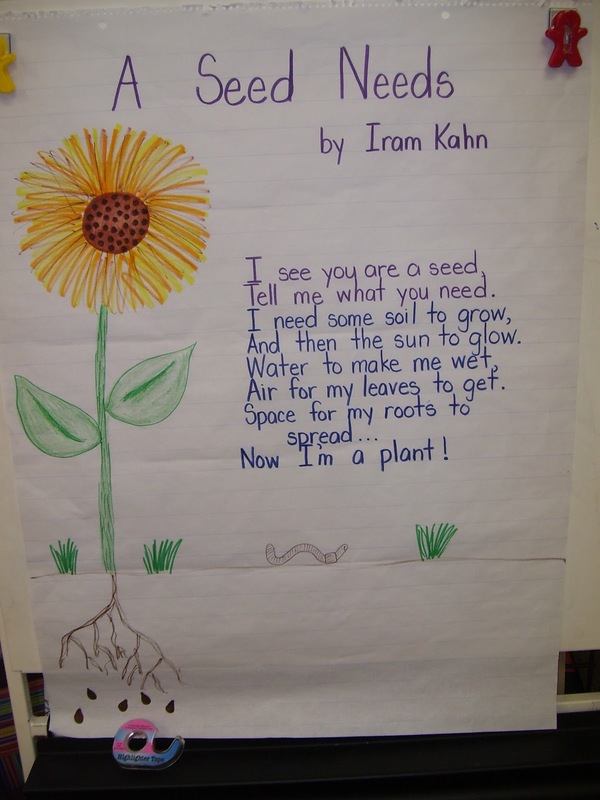 This came from CTP Phonemic Awareness Songs and Rhymes for Fall. I see this series as a must have for phonemic awareness fun! And I save the best for last...Wormology! My recording sheet for this is so old I can't post it right now, so I will rework it and post it asap! This is the one activity I look forward to the most. To hear them squeal and watch their reactions are priceless! This year, for the first time in the 10 years I've done this, I actually had every single student touching it and a few even clapped they were so excited! It was hilarious! I gave them each a nightcrawler (Thank you, Wal-Mart Sporting Goods Department!) and they recorded a picture, measured it with unifix cubes, and wrote what they thought of it. Then, we returned them to the ground, so, as one student put it, they can "help the Earth grow".